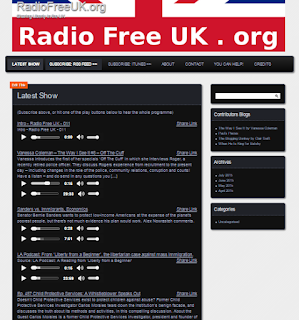 Radio Free UK - radiofreeuk.org - 11th Weekly show out now. We want to be 'News 24 for the EU Out campaign' - with the latest headlines and back stories - you can be part of it - as a consumer or creator! The project is developing (the tech is stable!) and we have been promised more exclusive/first to air content! You can listen to the whole show from the website or (better!) subscribe to the pod feed directly or via iTunes (links to both on the home page). Theres a long way to go yet - and we can use all the help you can offer - researching content, creating original content or simply reading/recording other web content (we have permission, but not the resources!). - How a child protection worker in the US turned whistle blower, and still has a future. The site has an archive of old shows (in progress) and an improved interface - for desktop and mobile. Have a listen, use the blogs comment sections, email us - get involved, ready for the EU Referendum! "ISIS are not Islamic" - the pivotal moment that inspired Theresa May to recast the Nasty Party the mould of the Pakistani People Party. We have heard it a thousand times over from the Conservative top brass (the leaders of our country) - whenever an Islamic inspired terrorist event occurs, their first thought is not for the people of this country, instead their first thought is to protect Islam from criticism. It was so obvious, and such an obviously inappropriate response, I thought there must be more too it, so did a bit of digging. (Remembering, of course, that Asian is the modern progressive way to refer to Muslims without mentioning religion). While both David Cameron and Theresa May are very insistent on what is and is not Islamic (despite no formal training or study that they have declared), the impression that I had built up was that Theresa May was even more defensive of Islam that David Cameron - an impression from various speeches, statements etc she has made as reported in the main stream media - nothing private, no inside information, no leaks. So I decided to look into Theresa May's background a little, wondering if there would be any clue as to how Islam could have made such a remarkable and enduring impression on her. The first thing I noticed is that she is very austere, very po faced, very private and there is not much information in the public domain about her - quite remarkable for such a powerful figure. However there was a reference to Theresa May first meeting her husband (to be), and it transpired that they were introduced at university by a friend - none other than Benazir Bhutto who went on to be the first female leader of a muslim state - being elected on two different occasions to the post of Prime Minister of Pakistan and being assassinated in 2007 when expected to win the post on a third occasion having just returned from exile. At the time of her assassination (December 2007) which was after the 9/11 (September 2001) attack on the 'Twin Towers', but before Osama bin Laden the 'master mind' and leader of al-Qaeda had been found and killed in Pakistan (May 2011) where he is believed to have been living possibly since 2004, Benazir Bhutto was completing a book entitled 'Reconciliation: Democracy, Islam Democracy and the West. In her book, Benazir Bhutto makes clear her view of Islam - a view given to her by her father - and while it is presented by, and in the language of a twice elected Prime Minister of a complex country, underneath it is a rather naive, child like view - were she a Christian you could imagine she would be thinking of God being an old man with a beard sitting on a cloud. Benazir clearly put her country, its people, their culture and democracy first - but then tried to weave a narrative for Islam (to which she was committed) that would make it fit - it is this narrative that seems to be the same one promulgated by Theresa May and then by David Cameron. One can understand that Theresa May could well see Benazir Bhutto as a model for her own career - and to have a friend murdered in such circumstances, and then for her book to be posthumously published - this could well be the pivotal moment that I had guessed had to exist. And all just a couple of years before the Conservative party is elected to government, and although in government in a coalition, it was a coalition with a party who were themselves very anti-English, anti-British and in favour of diluting British culture with alien cultures, continuing the work done by the previous Labour administration over more than a decade under Tony Blair and Gordon Brown to make the UK a 'rainbow nation' of 'multi-culturalism'. Unfortunately Benazir Bhutto's attempts to spin Islam into a coherent model with Democracy and the West, as being peaceful and opposing the work of the jihads terrorists is laughable. Although this verse may appear superficially problematical, a close reading shows that it does not advocate violence against people of the Book, only those who reject God and his teachings outright. So even this most moderate of Muslims, seeking to reconcile Islam and the West, says that the Koran does call for violence against atheists - but Christians may be OK.
Also (still only in the second chapter), she states that the Koran is against terrorism and the killing 'innocents' - but as the terrorists of ISIS claim they are at war, and non-Muslims are not 'innocent' they would seem to agree with her, but believe they are working within that 'rule'. Regarding 'proof' that Mohammed values life she cites an edict that a Muslim may deny their faith verbally to save their life, as long as they keep the fail 'in their heart'. Again I am not reassured, as this suggests it would be Ok to kill someone if they didn't keep the faith in their heart(!). There are many examples of this, arguments that may work in the mind of a girl who adores her father and his memory and dare not contradict his teachings, but not arguments that anyone would be foolish enough to present in a genuine Western Democracy - as they would crumble before they had cleared the speakers lips. Unfortunately these are the arguments that have entered Theresa Mays head, and have been spread among the Conservative Party hierarchy. This half baked misunderstanding of what was being presented and why may also explain the amazing rise of Sayeeda (Baroness) Warsi - presumably seen as a 'young Benazir' by the Conservative high-command, followed by her rapid fall when it was found there was nothing to her - but this would have been true even had she been a young Benazir, as the logic supporting Islam in the West with Democracy was always flawed. UK MP's think Daesh "blues the lines between Islam, Muslims and Islamists" and that is good? - huh? - isn't English their first language? UK MPs wrote to the BBC asking them to stop calling the new Caliphate 'Islamic State' and to call it 'Daesh' instead. If you want the full background on where the word 'Daesh' comes from and why Islamic state may not like it http://www.radiofreeuk.org have an item on this in this weeks broadcast (online till next Friday 10th July). International Business Times have an article with a copy of the letter sent to the BBC by the MPs, and the BBC's reply. I was stunned on reading the third paragraph where they promote the use of Daesh because it "blues the lines between Islam, Muslims and Islamists". WTF is that supposed to mean? There is a common English phrase "blurs the line(s)" it could be they meant 'blurs' instead of 'blues' - but the point of the the phrase 'blurring lines' is that it makes things harder to differentiate/separate - and surely this is the opposite of what is intended! The idea is to separate Islamic State from other Muslims - not blur the lines between them? What an insult to the English language that this letter should go out like this - and what a joke that it is trying to advise the BBC on the use of the English language! The real reason purdah has uniquely been abandoned for the EU Referendum. The 'for Britain' grouping are reformers. They don't want 'out' they want 'associate membership' that hasn't yet been publicly defined and can't be implemented in the time available before a referendum. Matthew Elliott, leader of the 'for Britain' groupings, saw the 'Yes2AV' campaign fail because it was led by the Electoral Reform Society (ERS) who were *against* AV, they wanted (and still want - the now obsolete) STV. Matthew Elliott now wants to recreate this in the EUout campaign - by leading it to fail, by leading it as badly and half heartedly as ERS led Yes2AV. The reason purdah has uniquely been abandoned for this referendum is precisely so this last minute Damascene moment can be stage managed - in the last week or so this offer will be made and hugely publicised - and the UK public will be expected to vote 'in' in a promise (cast-iron no doubt). With (but this time) only UKIP still speaking up for out! Conservative Eurosceptic MP's (if any exists) are now cornered. Either they stay quiet and so passively support Cameron until his renegotiation is complete, or they back Conservatives for Britain and actively support Cameron until his renegotiation is complete. See whats been done there? There is no space for any genuine EUout'er to show their face within the Conservative party - at least not until Cameron completes his renegotiation. But what then? Either to back Cameron, close their eyes, cross their fingers and follow where ever Cameron leads them which will be a Cameron led government in or out of the EU. The second option is not the Conservative way - anyone capable of such oppositon to the elected leader would have been weeded out well before being selected to run in the last general election. This is why I believe Mark Reckless and Douglas Carswell left the Conservative party - they saw these were the options and realised no Conservative MP would be going against Cameron. As long as Cameron is the leader of the Conservative party, all Conservative MP's are #EUin. Prepare for the EU Referendum to be postponed! UKIP will need to win the 2020 General Election to leave. Cameron and the conservatives are making great play about waiting to see what 'renegotiation' delivers. I have no doubt that, should an 'in' vote not look certain, then Cameron and the EU will declare treaty changes are required and will be made to meet some objective or other (the actual detail doesn't matter). At this point it will be declared that it is stupid to have a referendum until the treaty changes have been formerly completed as we will not know for sure what in or out means. And so the referendum will be postponed until the changes are complete. The treaty changes will not be completed while an 'out' vote is likely. So there will be no referendum from the Conservatives until 'in' is certain. Then the only way to get 'out' will be to give UKIP an absolute majority in the 2020 general election. Why the EU is fundamentally bad for the UK, and no amount of 'renegotiation' will make it any better. The EU are acting rationally and sensibly for its own interests - but these are fundamentally different to the interests of the UK. This is the core failing of the EU for UK interests. Greater Good refers to the sacrifice of the good of someone/thing because overall it will be better for the group. In a family, members may happily make sacrifices for other members of the family or for the family as a whole - although if what is asked/expected is too much then a member may leave or cut themselves off from the family or certain members of it. As an independent legal entity/personality the EU operates for its own good - but this will often be at the expense of one or more of its members. In fact the only time it matters that the EU is a legal entity with governmental force is when it needs to make a member make a sacrifice for the greater good... otherwise no force/coercion would be required. So being a member of the EU - instead of a trading partner - means it can oblige the UK to act against the UK's own interests because it benefits some other part of the EU. In fact the ability to oblige the UK to do so is the sole reason for the EU to have any power over the UK at all. As anything that benefited the UK, the UK would freely do anyway, whether or not a member! The 'flip side' of this is that other countries may be made to act against their best interests to benefit the UK in some way. Well, I don't want to force countries to do this. I believe it is fundamentally wrong for a countries government to force its people to act against their own interests. And I certainly don't want to benefit from the fruits of such evil coercion! But even if I didn't have a moral stance on this - the EU is spreading into more and more disadvantaged countries - who have nothing to give up for 'the greater good', so the traffic/sacrifice can only be one way - away from the UK to other parts of the EU. This is why the UK should leave the EU - so we can act as we see fit for ourselves - not be coerced/obliged to act against our own best interests and be forced to make sacrifices that would not otherwise choose to do. On 'EUSceptics' or EuroSceptics if you want to pretend EU is Europe. There is no time for Cameron to get any treaty change from the EU. Without treaty change there is no change worth the name - it can all change back again whenever the EU commission simply decide to change it. So the battle lines are drawn right now. In with the current treaties - including the hated Constitution/Lisbon Treaty. In light of this, anyone who isn't already signed up for 'out' cannot be trusted in the out campaign. This is a reflection of the debasing of EUphile and EUsceptic - especially by the BBC - now an EUphile is 'In regardless', EUsceptic is 'In but could be improved'. They have no word for anyone who thinks the UK should rule itself.